Lightly spray the top of the parchment paper. Line the bottom of the loaf pan with a single layer of graham crackers and top it with the pint of SorBabes Peanut Butta Luva, using a spoon or spatula to spread it out into an even layer. Drizzle on 3 tbs of caramel and the peanuts. Then layer on another single layer of graham crackers. Spread 3 tbs of fudge on top of the second layer of graham crackers and top it with the dark chocolate chunks. 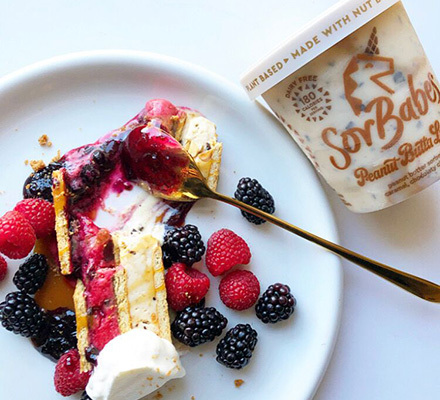 Next add the full pint of SorBabes Raz n’ Berry, using a spoon or spatula to spread it into an even layer. Top the sorbet with 3 tbs berry jam and a final single layer of graham crackers, pressing them in firmly. Wrap the loaf pan and freeze 6 hours and up to overnight. To unmold, invert the loaf pan onto a cutting board or serving platter and cover in a hot, damp towel. You may need to repeat this a few times. The loaf pan should loosen away from the cake and pull right off. Remove and discard the parchment paper. Immediately slice into 8 to 10 slices and enjoy with berries, your favorite whipped cream or topping, extra jam and caramel sauce.